Having explained our pre-submission peer-review last week, in this post we’re going to explain our post-publication peer-review. Why use open post-publication peer-review? Most journals use post-submission peer-review and only make the work public online once this process is completed. This results in long delays before the work is made public, often many months or even years in the worst cases. These publication delays (see figure below) are largely unnecessary: making a work public and operating a peer-review process on that work are two separate processes that do not need to interfere with each other. Daniel Himmelstein (2015). 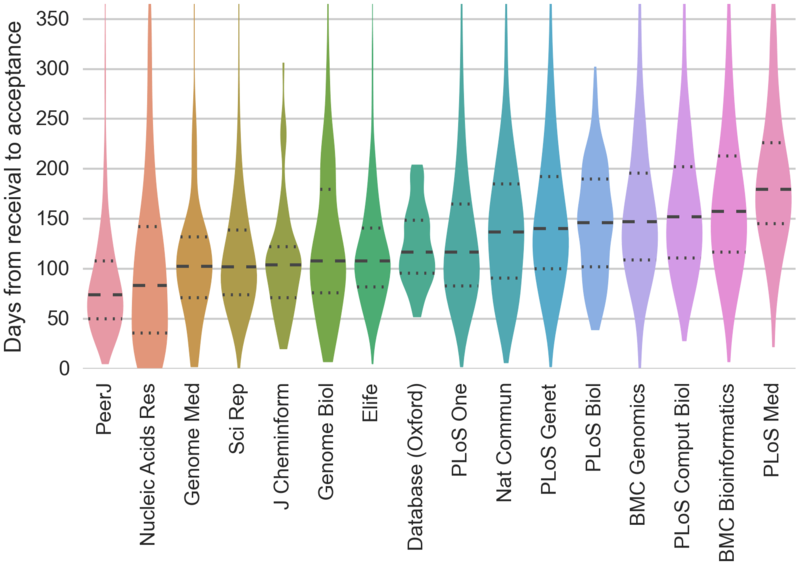 Publication delays at PLOS and 3,475 other journals. Zenodo. 10.5281/zenodo.19117 Licensed under the Creative Commons Attribution License. By publishing almost immediately after pre-submission review, RIO Journal will help researchers establish the priority of their research outputs. We aren’t the first to use this system: F1000Research have been successfully using post-publication peer review since 2012 and everyone including PubMed accepts the validity of articles published this way. Why is open reviewing a good idea? Very few think that single-blind reviewing is optimal. Some think that double-blind reviewing results in fairer outcomes but we believe that this only treats the symptoms and does not address the causes of improper or poor reviewing. 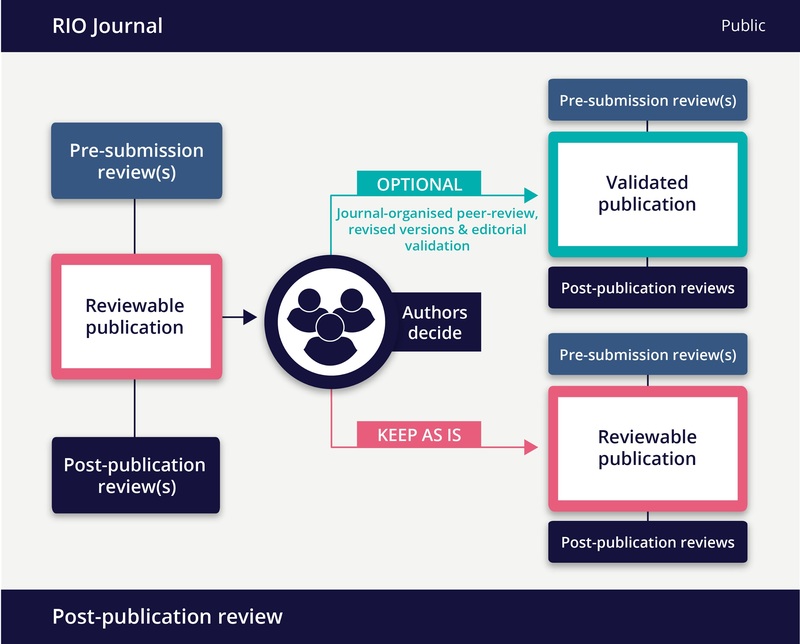 At RIO Journal, all post-publication reviews will be open, in addition to pre-submission reviews which go public as well – there will be no option to provide non-public review, pre-submission or post-publication. Furthermore, all reviews will be made available under the Creative Commons Attribution License (CC BY), so that the reviews are open access and attributed to their authors, just like the published works. Again, it’s important to note that open and published reviews are not a radical ‘new’ thing in some subject areas. For instance, the British Medical Journal (BMJ) has identified reviewers since 1999, and Biology Direct has been successfully using open and published peer-review since 2006. For subject areas where open, published peer-review is a novel concept we suggest – try it for yourself with us! Open and published reviews have benefits for both authors and reviewers – this is particularly important to consider given that reviewers do their work as an unpaid service to scholarship. To be able to have a citable, open record of contributed reviews, it is desirable to provide small and impartial reward for reviewers. Post-publication review at RIO is just the 3rd step of checks on a manuscript. The first step is the pre-submission peer-review (see our previous blog) while authoring, the second is the technical and editorial evaluation in-house. The result of all this is that authors have the chance to revise and improve their manuscripts several times. After a manuscript is published, the authors have the option to request journal-arranged post-publication peer-review and editorial validation or to keep the publication in its first version, submitted and published after pre-submission review and technical/editorial checks. Authors can also decide at any point to request publication of revised versions. So, they have the chance to improve their works if post-publication reviews are negative. Only RIO Journal editors can provide the stamp of Validation on an output once sufficient, acceptable post-publication reviews have been received. Next week we will blog about our plans for societal impact labelling on outputs to facilitate cross-disciplinary reading and collaboration. If you have any questions in the meantime, please don’t hesitate to contact us via the comments section, Twitter @RIOJournal, or via email.